Posted on 17, August 2016 by EuropaWire PR Editors | This entry was posted in Denmark, Energy, Gas & Oil, Government, United Kingdom and tagged Brent Cheshire, Dong Energy, Hornsea Project Two, Huub den Rooijen, offshore wind farm, SMartWind. Bookmark the permalink. 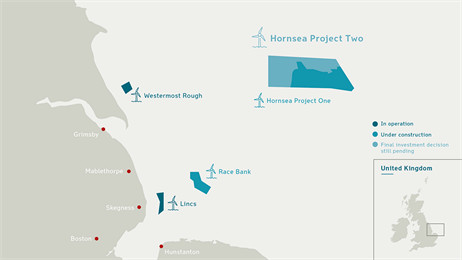 DONG Energy has today (16 August) welcomed the decision of the Secretary of State for Energy to grant development consent for the Hornsea Project Two offshore wind farm, located 89 kilometres off the Yorkshire coast. FREDERICIA, Denmark, 17-Aug-2016 — /EuropaWire/ — Hornsea Project Two will have a capacity of up to 1.8 gigawatts (GW) and will consist of up to 300 turbines. It could meet the electricity needs of approximately 1.6 million UK homes per year. The Development Consent Order (DCO) was approved by Greg Clark MP at the recommendation of the Planning Inspectorate, and covers the entire project including the turbines, foundations, offshore and onshore substations, array cables and export cables. “Development consent for Hornsea Project Two is very welcome. We have already invested £6 billion in the UK, and Hornsea Project Two provides us with another exciting development opportunity in offshore wind. DONG Energy will now review the details of the DCO.